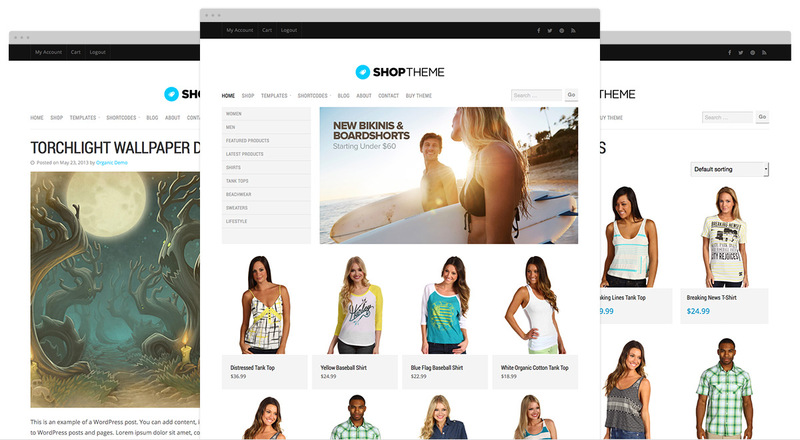 Start your online storefront using the latest version of the Shop Theme! Version 3 of the Shop Theme keeps a clean, minimal design while improving upon several aspects of functionality. Shop now features more custom menu sections for adding product category navigation. The responsive framework has been reworked and improved upon. All theme options have been moved to the WordPress customizer for a seamless setup process. In addition to several other improvements, the theme now includes licensing for automatic updates as well! View the demo to see the theme in action. Shop works with the popular WooCommerce plugin and the Exchange plugin from our friends at iThemes. I bought the Shop theme a couple years ago. Do I have to pay for the upgrade to v3, or is it free? If your support subscription is no longer active you’ll need to renew this in order to download the latest theme version. You can confirm by login into your account and seeing it the download is available or not. If you have any further questions about this send us an email through the contact form: https://organicthemes.com/contact. I purchased the Developer subscription, but I can’t find where to download Demo Content for the Shop theme in the My Account Downloads section. Can you help me? The demo content is now available in our documentation files, and I’ve also updated the link you mention so it should be working now. These themes are really awesome, especially Durpal Mag these are pretty cool and very attractive, its layout is cool, the design is great, and its framework is really very flexible. Durpal also have an option of review, which is a great option. I am going to try this one and also recommend other to try this this is much better than above mention.